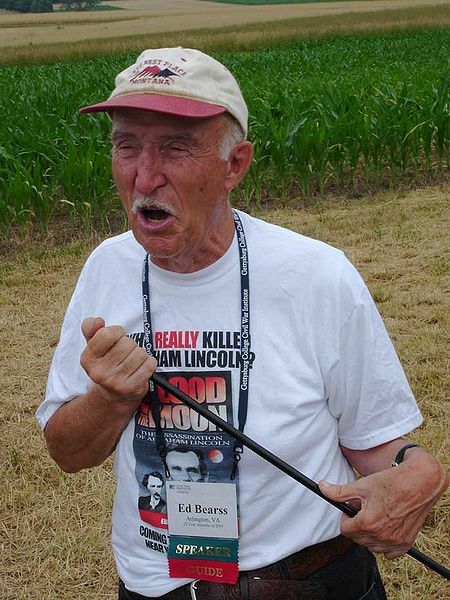 Ed Bearss is known as the Pied Piper of the National Park Service. His battlefield tours are legendary, as are his photographic memory, stentorian voice, and physical stamina. If there has been one criticism of Mr. Bearss’s work it is that his ability to spellbind tourists on the battlefield has not translated to his writings. The good folks at National Geographic tried to remedy this deficiency – if it can be called that, since Bearss’s The Vicksburg Campaign is a tour de force after 25 years – with 2006’s Fields of Honor, which consisted of transcriptions of Bearss tours of about twenty Civil War sites. This year they follow that up with Receding Tide, which uses more detailed transcriptions to focus more narrowly on the period from the end of 1862 through the early days of July and the twin Union victories at Vicksburg and Gettysburg. I was a little nervous about the interview, which was set up courtesy of Penny Dackis at National Geographic. I bought a digital recorder for the event, and like most of you I really hate the way I sound on tape (or digital). Add that to the fact I was going to be talking to possibly the most recognizable name – definitely the most recognizable voice – among students of the war, and you see where I’m coming from. I tried my best to throw my questions in quickly, step back and let the man speak. BR: Your new book, Receding Tide, covers a broad period and is concerned with more than simply the campaigns of Vicksburg and Gettysburg. EB: It starts with the Union setbacks of Fredericksburg and Chickasaw Bayou, when the Union has run into severe difficulties. It follows through to the early stages of the Vicksburg Campaign when the Confederates are doing fairly well, and through Chancellorsville, playing [the two theaters of operation] off against each other, and ending for all practical purposes on the Fourth of July, 1863, though Gettysburg doesn’t really end until Lee crosses [the Potomac] and Vicksburg doesn’t end until Sherman drives the Confederates out of Jackson. BR: The concept behind this book is similar to that of Fields of Honor, which National Geographic published in 2007? EB: Yes, both books are basically transcriptions of recordings of my tours at the various sites. In Receding Tide, [co-author J. Parker Hills] edits them down and fills in the connecting parts. BR: In what ways do these projects differ from traditional works, like your Vicksburg Campaign? EB: I’m standing on the spot when I’m talking about what happened there. People who liked the first volume said it comes across like I’m talking, that it’s like being on the field with me. Talking in the field, you can get more emotions in than if you’re writing and footnoting everything. People who like oral presentations like it the best. Fields of Honor has sold better than any book I’ve written. BR: How do you think the two types of works, the tour transcriptions versus traditional works like your Vicksburg set, differ – that is do you like one better than the other, or are they really apples and oranges? EB: The three-volume Vicksburg study is for people who want to know everything. Receding Tide looks more at the highlights, interesting facts and personalities. It has more of an emotional appeal. BR: Would you say it tells a better story? BR: What different challenges are presented when conducting a tour of Vicksburg versus Gettysburg? EB: Gettysburg is much better known – in the English language, there are more books on Gettysburg and Little Big Horn than any other campaigns because they sell well. Little Big Horn sells well because nobody really knows what happened in those last thirty minutes or so. Gettysburg sells well because so much has been written and is known about it, particularly the controversies. I can do a complete tour of Vicksburg, for a well-informed group, in about three days: two on the campaign up to the seige, and one on the seige. Gettysburg, because of the knowledge of the general public and the interest in the personalities, the fighting of the Lost Cause, the Meade/Sickles controversy, and the fact that more people know a lot more about Gettysburg, it takes longer to tour. The buffs know a lot about Vicksburg, but the general public doesn’t. When I took the job with the National Park Service at Vicksburg in 1955, I did so because it was the only Civil War site that had an opening. If I had had my choice, I would have said “Give me an eastern battlefield, give me Gettysburg”. That’s what everyone wanted, what everyone was writing about. Catton had just finished his trilogy, and Lee’s Lieutenants focused primarily on that. But when I got out there I found out Vicksburg had a lot going for it. I’d more or less become convinced that the Vicksburg Campaign is why Grant became General-in-Chief in February of 1864. Meade’s result after the Battle of Gettysburg was not what the President wanted. In his mind, Vicksburg was a more important victory than Gettysburg – except for the address he gave there. You can argue that the worst day of Meade’s life was when he issued the congratulatory order to his troops on July 7th, where he calls on them for “further exertion to drive the enemy from our soil.” Lincoln will say “My God, my God! What does the man mean? It is all our soil!” On the same day, Lincoln gets the message from Grant that Vicksburg has fallen. And not only had Grant accomplished the military objective, he has opened the Mississippi river to divide the Confederacy, and has destroyed a Confederate army of 40,000 men. BR: The letter that Lincoln wrote to Meade, the one he never sent, it has always struck me that we can give so much import to a letter like that, one that Lincoln thought better of and didn’t send, when we don’t have any idea how many other letters like that were written and to whom. EB: We only know about this one because he kept a copy. BR: And because Nicolay and Hay made sure it was preserved. BR: Are there any similar studies like this from National Geographic in the works? EB: Yes. Because of the increased interest in the Revolutionary War, we’re considering doing a book on those conflicts similar to Fields of Honor, which will again be based on my battlefield tours. There was more, but we moved far afield from the focus of the book, talking a lot about Meade and the bad spot into which he was put after Grant was named General-in-Chief and how history has perhaps misrepresented what Meade would or would not have done had Grant not come east; the influence of surviving correspondence (or lack of same) on the way history has treated various commanders; and even an interesting tidbit regarding why he doesn’t spend much time on the internet and what influenced his decision to retire from the NPS (in short, in the 1940s real men didn’t type). Maybe at some later time I’ll cover that material here.